New Year's Eve in Petoskey, Michigan! We will end 2012 in style! The Petoskey Public Library and Crooked Tree Arts Center have invited us to be part of their community-wide gala. Admission is very reasonable: Buttons are $7 for adults and $3 for students. They expect a sell out again this year, so order your buttons here. 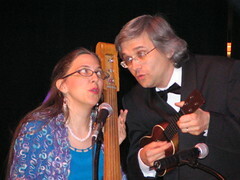 I'm thrilled that Lil' Rev posted an article about me on his "Fountain of Uke" weblog. The article is titled "In Search of a Ragtime Uker". In the article Rev gives some background on the story of ragtime music, and generally gushes about me [blushes]. Thanks Rev! The article includes a video interview, which I've embedded below. Be sure to read the article too. If you are interested in the ukulele, check out the beautiful new Ukulele Yes! web site. It's a site dedicated to ukulele education, especially in the classroom. It's a revival of the Canadian-published Ukulele Yes! magazine, now edited by James Hill. and Dusk Flight (mp3). The Mp3 audio links are full audio recordings with bass and rhythm uke accompaniment. Mp3s are now available for two new tunes: Looking Glass Frolic (mp3) and Service with a Smile (mp3). The Mp3 audio links are full audio recordings with bass and rhythm uke accompaniment. Click on the photos to see Youtube videos of me playing the the tunes on ukulele. Service with a Smile (mp3 audio recording) (video). Here are mp3 audio files for two newly-composed tunes; Snowflake Dance and Oldtown Quickstep . Here's a merry new song I sing backed up by the Heftone Banjo Orchestra: Santa Claus Rag. I added words, chords and audio files (mp3 and ogg-vorbis) for April Showers from our soon-to-be released Fabulous Heftones CD In the Garden. I posted my freshly-recorded ukulele version of Scott Joplin's popular 1902 rag The Entertainer (ogg | mp3 ). An ice cream truck has been driving by the house blasting out this tune all summer. The tune's been stuck in my head, so it's time to let it out. I just dressed up the heftone.com site for a more dapper look. The site now allows comments too, so feel free to chime in. Login or register to post a comment.